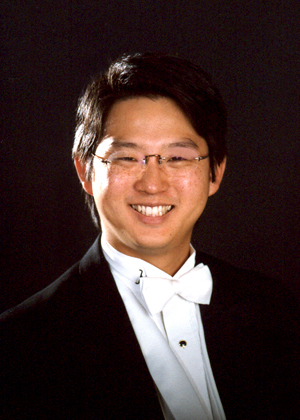 Ken Hakoda: Bio & Choral Music | Santa Barbara Music Publishing, Inc.
Ken Hakoda (b. 1973) is the director of choral activities and assistant professor of music at Kansas Wesleyan University. He is also the music director / conductor of Salina Symphony Orchestra. He is a native of Japan and has lived in the United States since 1989. He received his Masters of Music degrees in Instrumental Conducting and Theory / Composition from Wichita State University and a Bachelor of Music degree in Theory / Composition and a Bachelor of Arts degree in Music Education from St. Olaf College. Hakoda is known for his talent as a composer with over 20 works to his credit. He has won a number of awards and honors as a composer, including the 1998 Claude T. Smith Phi Beta Mu Composition Contest, the 1996 MMEA Collegiate Composition Contest, and a Departmental Distinction at St. Olaf College. Ken Hakoda has 1 titles published with Santa Barbara.